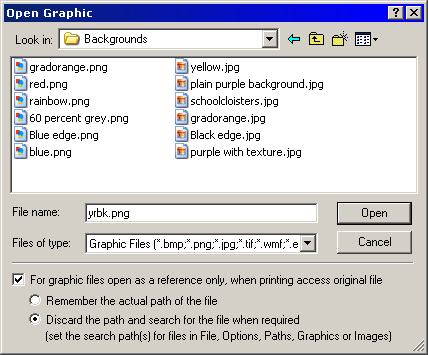 Version 3 of the software introduces a new option where graphics can be stored in a central location and the path to this location entered in File>Option>Paths>Graphic files. This article describes the new feature but also looks generally at how the software handles graphic files. While remembering the path is certainly a viable option it does have the disadvantage that neither the graphic file or the job file (tnj) can move from their original locations. Should this occur the software will not be able to locate the graphic when needed. 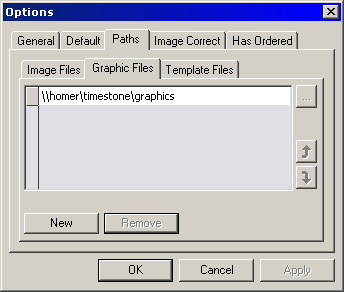 The third option is a new feature of Version 3 and allows for graphics to be stored in a central location - a graphics server - making them accessible to all users. The screen grab below shows such a location entered in the UNC format.